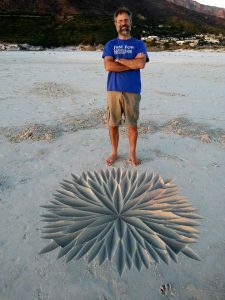 Check out some other sand artists around the world. 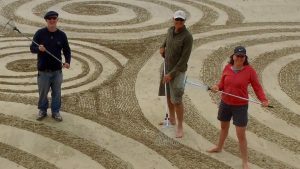 There is a great awaking happening around the world and some are compelled to return to the ancient craft of drawing in the sand. 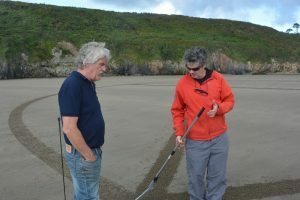 Making marks on a smooth beach could have been where humanity first began to expand their intellect. Sean Corcoran and Joe Lonergan work from the Copper Coast in Waterford Ireland and have a whimsical organic style and they can work fast. They had vines wrapped around me for a half mile before I grabbed a rake. Their style just flows with the beach and becomes part of the landscape itself, just perfect. Joe is hilarious and a bit of a wild man, he gave me some seaweed to eat – it was salty. Sean works as a full time artist through his successful company, The Art Hand. They do some high profile stuff for media and promotions – true professionals and highly respected. I have a lot to learn from these great guys. 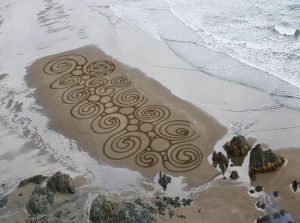 Matthew Hart and Sara Kubiak organize gigantic designs near Cork Ireland and have a mystical yet geometric style that pops right out of sand. They do highly intricate constructions and can somehow manage many people at a time for some of their massive designs. 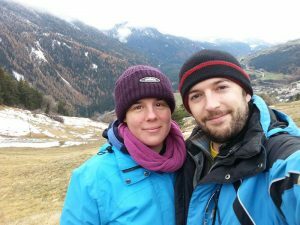 Matthew is an insane musician and Sara organizes community clean-ups to make her beaches beautiful and ready to draw on. 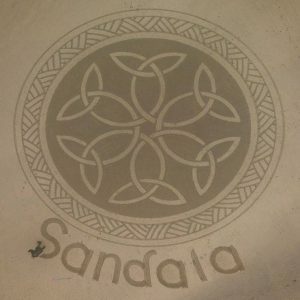 They started a large Facebook group dedicated to sand art called West Cork Sand Circles. 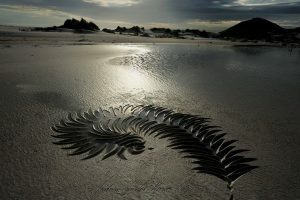 Check it out, they have tons of amazing pictures and a fantastic website linked to other sand artists. Truly inspirational! 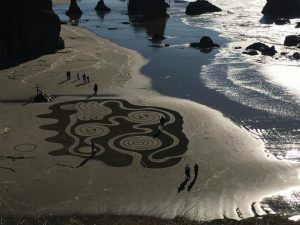 Jon Foreman has a beautiful style with perfect geometric lines and a wonderful fade technique giving his beach art depth and color. He has so many great pictures and sells calendars loaded with them. He also makes clever stick and rock sculptures that have an elegant look. His work is top notch and must be respected. 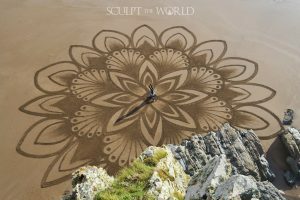 Check out the Sculpt The World’s Instagram profile and prepare yourself. 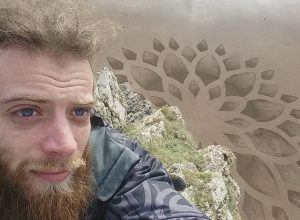 David, The Beach Tagger, paints massive bands of intricate patterns and circular mandalas all across New Zealand. The patterns he uses within his geometry are truly original and amazing. To top it off, he has an insane photo editing technique giving his pieces true color that looks like paint. The Beach Tagger has a such a unique style with some of the longest and straightest lines out there. How does he do that? 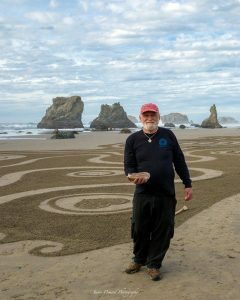 Andrew, The BeachScriber, is a calligrapher that has taken to the sand with some amazing results. In a league all his own, he has a technique that cuts the sand so clean it looks like stone carving. He does his writings and designs in Cape Town South Africa and has a style that leaves you wondering – how. His portfolio is massive and filled with words, sayings and beautiful patterns he creates with his magic wand. Someday I’ll sneak a peak at how he does it but for now I’ll just enjoy his art. You must check his Instagram page out. Sandala holds perfection of symmetry in mind when creating – you can tell. Its unclear if this is a man, a woman, or multiple people involved and the mystery adds to the appeal. 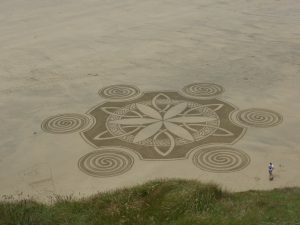 One of the best qualities in this art is the overlapping or knotting effect Sandala commands on the beach. The knotting designs are perfect and just mesmerizing but that should not take away from the mandalas produced. It looks like they might sell or make sandals and clothing and if so, I need some because I only circle in flip-flops and need a new pair. Love this style because it matches mine in many ways – thank you. Denny’s style can be noticed immediately, labyrinths of winding paths stretch across the beach. 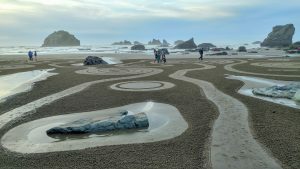 Circles In The Sand has events happening all the time in Bandon Oregon for more than seven years now. 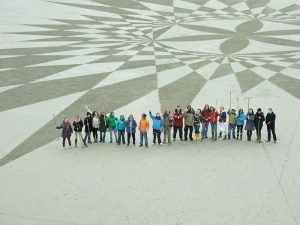 Denny has a massive amount of people coming out to his events to partake and walk his “Dreamfield labyrinths”. His style is so well developed and blended with the natural landscape leaving his fans a perfect width to walk and enjoy that days work. 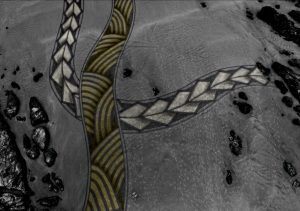 What motivates Denny to create these winding walk-ways that have no dead ends? It must be a great story. Guess we’ll have to go to the Oregon Coast, walk the path and ask him at the end of the path. Thanks Denny, see you in the sand.